” We met briefly at the conference in Colorado this past August. I wanted to share with you that I believe my immune system is responding very nicely to the BAC F3 formula (history of breast cancer) since beginning to take it back in April of this year. In fact, my partner has just been sick for the past week, complete with fever and chest and head congestion, as well as a few other people we know. I typically will catch EVERYTHING that everyone else has, especially if we’re under the same roof! This time around, though, I felt only the very slightest signs from my body that I was fighting something off, a bit of increased mucous drip in the back of my throat occasionally, not excessive, just sort of “there” and making itself known. I took a couple extra BAC capsules that day, a bit more water, took it easier exercising, went to bed early, and by the next morning, VOILA! I felt fine with no further problems whatsoever! 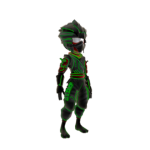 It never developed into anything more than what I just described! In the Quantum Leap Wellness series, we demonstrate how health can be simple while diseases can be complex. We write about common sense solutions that can frequently be FREE and will save you money today and significantly reduce your future health costs. 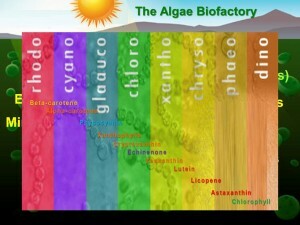 While the protein, mineral and vitamin values of Bio-Algae Concentrates (BAC) are impressive, these minute algae organisms are also rich in pigments that are biochemically as important to health. Without these pigments, our body could not synthesize many of the enzymes necessary for balancing metabolism. BAC contains a high level of enzymatic pigments and mixed carotenoids. In recent years, these pigments and carotenoids have received a tremendous amount of attention as potential anticancer and anti-aging compounds. Carotenoids are powerful antioxidants, protecting the cells of the body from damage caused by free radicals. Carotenoids and specifically beta-carotene and alpha-carotene are also believed to enhance the function of the immune system. Carotenoids represent one of the most widespread groups of naturally occurring pigments. These compounds are largely responsible for the red, yellow, and orange color of fruits and vegetables, and are also found in many dark green vegetables. The most abundant carotenoids in the North American diet are beta-carotene, alpha-carotene, gamma-carotene, lycopene, lutein, beta-cryptoxanthin, zeaxanthin, and astaxanthin. True vitamin A is found in the pre-formed state only in animal sources, such as liver. This is the form of vitamin A sometimes associated with toxicity and overdose since it is fat-soluble and is not readily excreted from the body. Some substances in plant foods are not true vitamins, but provide the precursors from which the body can then synthesize the appropriate vitamins. The carotenoid compounds of BAC are of this nature since they are used to produce pro-vitamin A. For example, β-carotene, which has only about 1/6 the biological activity of retinol (vitamin A); the body uses an enzyme to convert β-carotene to retinol. In other contexts, both β-carotene and retinol are simply considered to be different forms of vitamin A. In contrast to animal source vitamin A, the carotenoid complexes found in BAC are converted to vitamin A only as it is needed, thus minimizing the dangers of toxicity. In nature, algae are a primary source of vitamin A precursors – it is from algae carotenoids that fish livers derive and concentrate vitamin A. Until late in the 20th Century, the functions of these carotenoids were discussed only in terms of their potential vitamin A activity. But since it has been discovered that certain members of the carotenoid family, approximately 50 carotenoids of the known 600, are called “pro vitamin A” compounds because the body can convert them into retinol, an active form of vitamin A.
BAC contains several of these “pro vitamin A” compounds and especially some compounds like alpha-carotene known as “pro-pro vitamin A” for their capacity to not only traverse cell membrane but to span across the cell membrane. These and several lesser pigments such as phycoerythrin, tetrapyrrole, Phytonadione and the carotenoids are not just the “color” of living organisms but are used to carry on metabolic processes throughout the body. Without them, enzymatic reactions would be reduced until cellular disintegration occurred. Astaxanthin present in BAC is a pigment of the carotenoid complex found in the microalgae Haematococcus Pluvialis. It is an oxygenated pigment called a xanthophyll. Its unique molecular structure gives it a superior antioxidant capacity. Astaxanthin is 40 times more effective as an antioxidant than b-carotene, 500 to 1000 times more effective in inhibiting lipid peroxidation as an antioxidant than Vitamin E, has greater anti-inflammatory capability than Vitamin E, has almost 4 times the antioxidant capacity of lutein, is superior protection against UVA and UVB light-induced oxidative stress, is more stable in scavenging and quenching than b-carotene, canthaxanthin and zeaxanthin, is highly potent in enhancing T1 and T2 helper cells and IgM and IgG (secondary immunity) production, is more effective than lycopene and lutein in enhancing liver microsome detoxification activity (enzymes that metabolize drugs), enhances the actions of Vitamins C and E in the body, and enhances the release of retinol (Vitamin A) from the liver when needed. 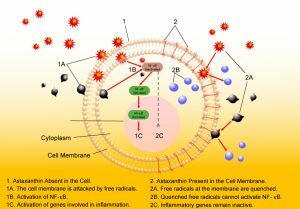 Astaxanthin has been shown to inhibit lipid peroxidation at the cell level thus protecting the cell membrane and the mitochondrial membrane within the cell; cross the blood-brain barrier which makes it available to the eye, brain and central nervous system to alleviate oxidative stress that contributes to ocular and neurodegenerative diseases such as glaucoma and Alzheimer’s; and to provide significantly more antioxidant capacity than other carotenoids and antioxidants, such as beta-carotene and Vitamin E.
Astaxanthin has also been shown to entrap free radicals by adding them to its long, double-bonded chain. 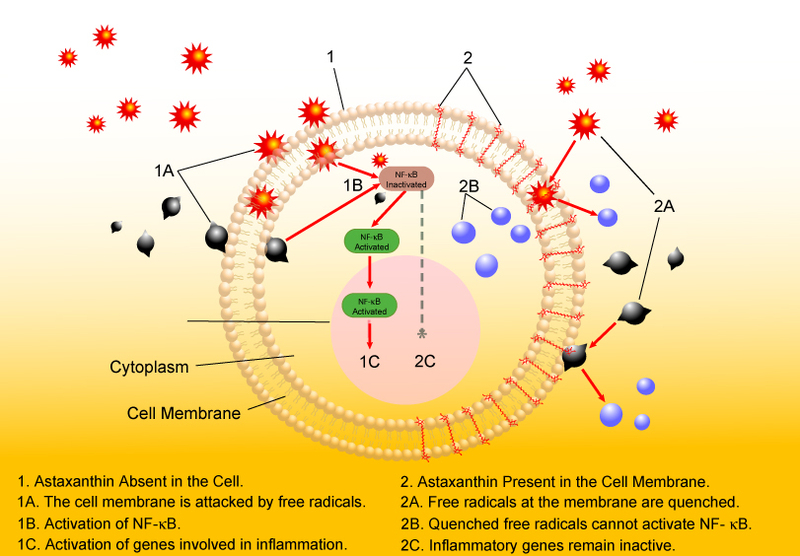 Rather than donating an electron, astaxanthin stabilizes the cell membrane, somewhat acting as a bridge in that its polar end groups span the cell membrane thus increasing its rigidity and mechanical strength, neutralizing singlet and triplet oxygen generated by UVA and UVB radiation and other sources, binding to a lipoprotein – an efficient transport vehicle – thus making it more bioavailable, and increasing immune system function, including heightened production of antibody-secreting cells and Interleukin 2 and suppression of Interferon-gamma. Newer studies have shown that Astaxanthin inhibits reactive oxygen species that cause inflammation, enhances the antioxidant actions of Vitamin E and Vitamin C, and encourages the release of Vitamin A from the liver when needed. Astaxanthin has 500-1000 times the antioxidant capacity of Vitamin E and 40 times the antioxidant capacity of beta-carotene. Many laboratory studies also indicate Astaxanthin works better than lutein, lycopene, and tocotrienols. Following ingestion, Astaxanthin is absorbed by the duodenal mucosa and transported to the liver where it binds with a lipoprotein for transport through the body and to the cell site. Because it is oxygenated, a xanthophyll has greater antioxidant capacity than many other carotenoids. Within the xanthophylls, the Astaxanthin molecule contains the longest conjugated, double-bond polyene chain along with both hydroxy and carbonyl groups at each end. 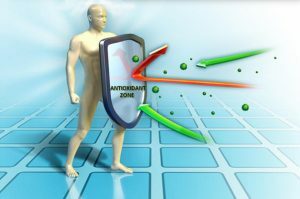 This configuration supports the greatest antioxidant capacity, its peroxyl radical chain-breaking abilities, its incorporation of free radicals into its polyene chain thereby more effectively trapping them, and its enhancement of Vitamin C as an antioxidant. While other carotenoids and antioxidants may perform one or two of these functions, Astaxanthin does them all and, in most cases, does them better. In addition to entrapping free radicals, Astaxanthin also de-charges singlet and triplet oxygen and inhibits reactive oxygen, giving it anti-inflammatory properties.